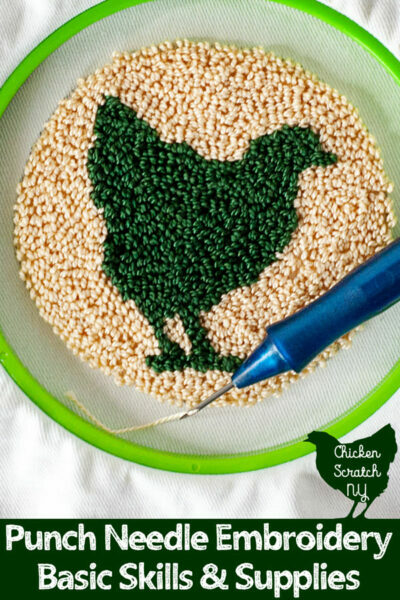 Punch needle embroidery is a wonderfully relaxing activity. 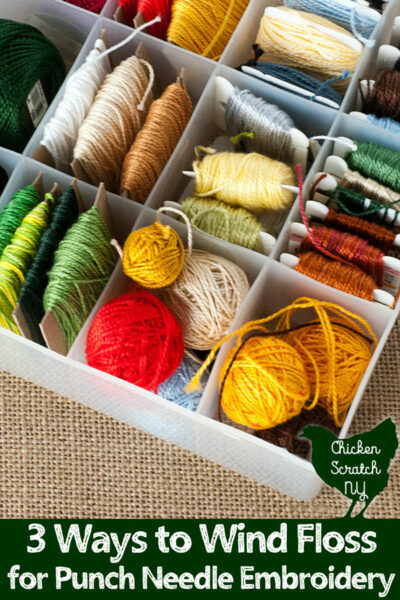 Until you get your thread knotted up and you want to throw it all out the window. It’s not quite as bad with the standard six strand embroidery floss but it is a complete nightmare with the size 5 pearl cotton that I prefer. Pearl cotton has a rougher texture and it tangles it’s self unmercifully, much like my hair. I’ve made it 30 years without shaving my head so I’m not about to let some tangles ruin one of my favorite hobbies! 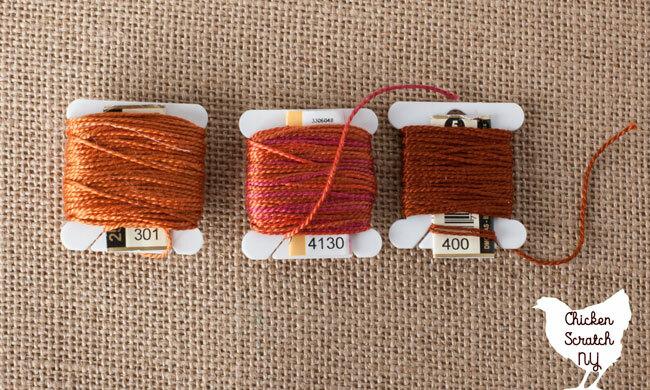 Over the last few years I’ve tried a few different methods to keep my threads contained and today I’m going to share my three favorites. 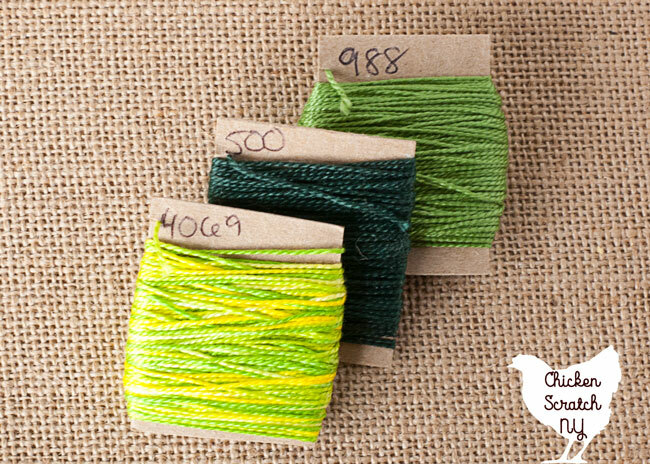 All three of these methods with keep your thread flowing snag free so you can punch without frustration. But first you need to take it from nicely wound coils or loops and undo it. This isn’t as big a deal if you’re using a smooth thread but if you’re unwinding pearl cotton this is a critical step. First things first, clip off the knot. Now stick your hand left inside the loop and loosely hold the thread. 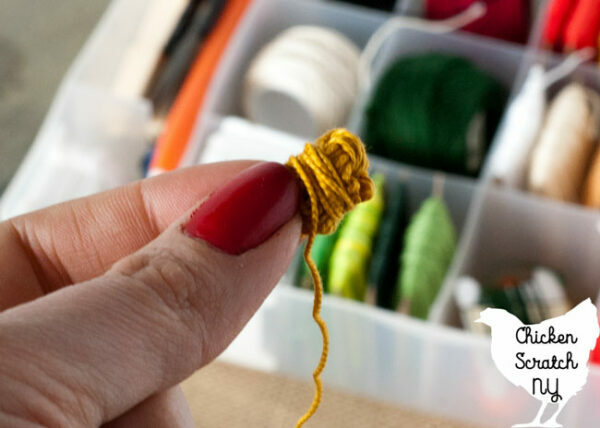 Use your other hand to carefully unwind one of the loose ends, one will easily fall away from the loop, the other will tangle. Test them both and go with the easy one. Unwind about 1/3 of the thread then carefully set the rest of the loop down. Then pick your favorite method and wind up the thread you just unwound. 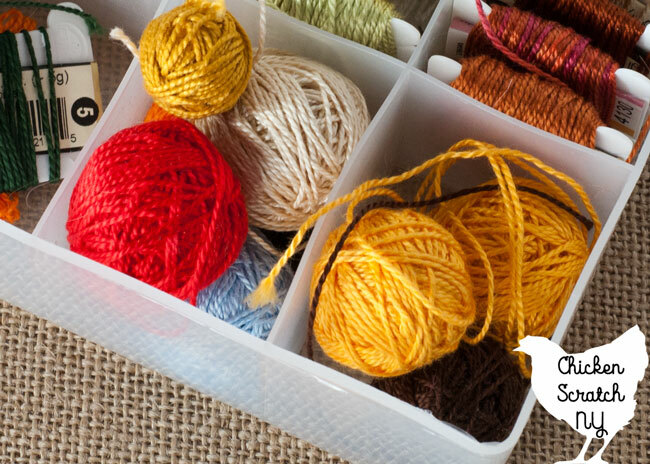 Repeat until all the thread has been transferred from the coil you bought to an easy to use bobbin or ball. Now that you’ve got a nice pile of unwound thread it’s time to wind it back up in an easily usable fashion. I’d say 90% of ready to use thread is wound up on cardboard bobbins. But you need to find out what works for you so you can spend less time pulling apart knots and more time punching. Most of my thread ends up wrapped around home made cardboard bobbins. I take thick, singly ply card board and cut it into rectangles that fit inside my thread box. Write the color name or number on the cardboard and cut a small notch along one side. Wedge the end of the thread into that notch then wrap the thread around the cardboard square. It’s the least attractive method but it’s the easiest for me and I love having my thread colors right there. I don’t really care much for my own purposes but it’s really helpful when I’m trying to sell my punch needle patterns and I want all you nice people to be able to replicate my design. Fancy thread like the absolutely stunning Valdani I drool over is easy to find in balls. DMC pearl cotton? Not so much. You can usually find black, white and ecru. I have seen a few more shades at Michael’s, make sure you check the size number! I have never been to that display in either Michael’s or Joann’s and found the threads in the right place. What you can do is wind your thread into your own balls. I like doing it, I find it pretty relaxing but there is a bit of a learning curve and it is time consuming and totally not necessary. The only time I really wind balls is if I only have about 1/4-1/3 of a skein left and I’m bored. Another down side is there isn’t an easy way to keep the number with the ball. You can try to wrap the label up in the ball but in my experience it rarely stays put. Personally I find the balls unravel the smoothest as you’re punching. It doesn’t take a lot of tension to stop your loops from sticking in the fabric so having it flow smoothly is a huge bonus. With the cardboard I usually pull off a few lengths at a time. 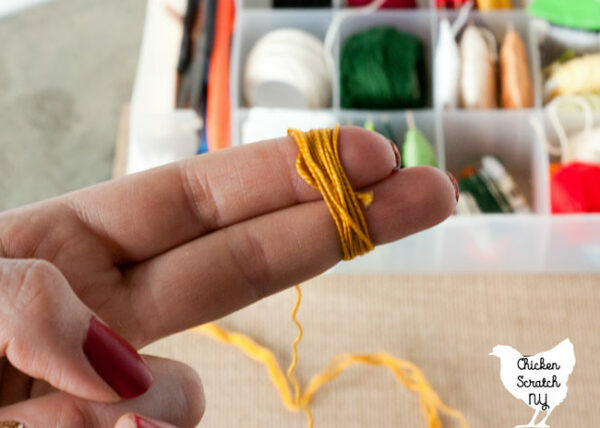 Start by wrapping the thread around two fingers about 10 times. Slide it off and then wrap the thread around the loop a few times, it should look a bit like a bow. Fold that in half, this is the center of the ball. 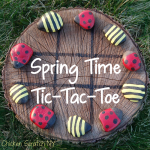 Start wrapping around the ball, rotating as you go and eventually you’ll run out of thread and have a nice ball. If you like gadgets this is the one for you! I was a big fan of this method when I was using regular embroidery floss, a standard hank of thread fits perfectly on one bobbin. Unfortunately the pearl cotton doesn’t fit, the thickness of the thread takes up too much space on the bobbin. Sometimes I’ll wind the thread this way if I don’t have any cardboard on hand and I don’t feel like winding a ball. I like to stick the label against the plastic bobbin when I wind it and it will stay put pretty well. 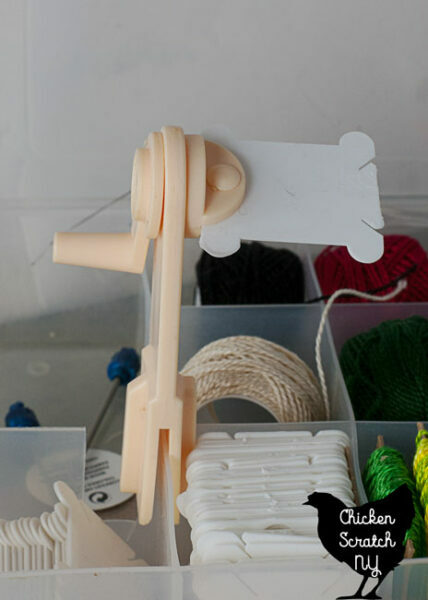 The winder fits right in the larger hole of the plastic thread organizer and when you want to use it it fits on the organizer itself. I keep all of my supplies stored together in a small craft/photo box I bought from Michael’s. The one’s they always put on sale for 5/$10. Inside that box I have a plastic thread organizer that just fits inside. I keep all of my rewound thread in that box, the dimensions of that box determine how large I cut my cardboard squares. I also keep some other things in there but that’s for another day. Underneath that box is where I store all the thread I’ve purchased that hasn’t been dissected. I find it’s easiest to keep it together until I need it. 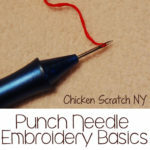 Check out my Punch Needle Embroidery Page for more ideas and sign up for my Punch Needle Newsletter to get new pattern announcements and relevant blog posts in you email!